Macaroons vs macarons. Do you pronounce them the say way? Anyhoo, I was sketching out ideas for my crochet paintings for the Sweet Tooth show this Friday in L.A. (come say hi! I’ll be there! ), and I kept changing my mind. 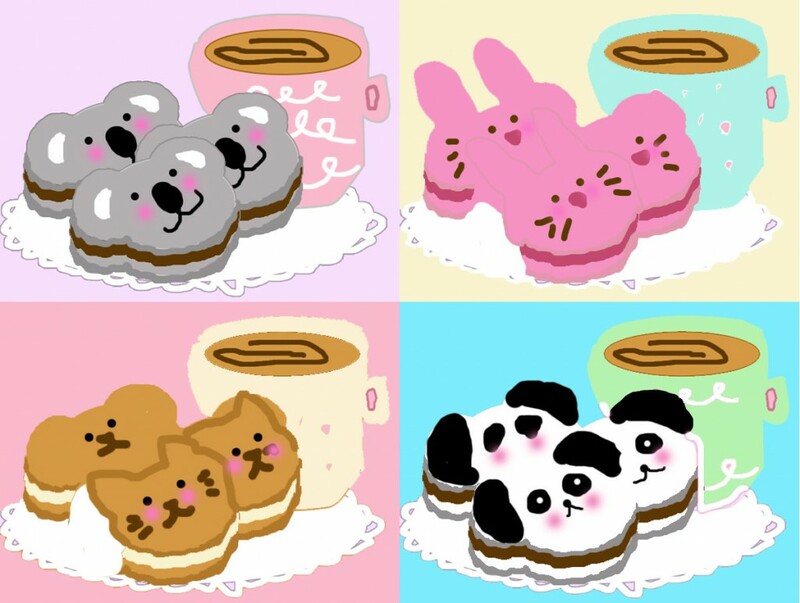 At first I was going to do a series of cakes, and thennnnn wanted to do a collage of bulk candies, and thennnnnnnnn I saw THIS blog entry and knew I had to try making macaronimals with coffee/tea. First up: my horrible sketch! I wanted the colors on all 4 canvases to look nice together, so sketching it first really helped me to make sure that everything looked relatively harmonious and that I wasn’t over-using one particular color throughout. I didn’t really know for sure how I wanted to execute the little cookie sandwiches and the sense of perspective I was going for. As it turned out, actually making little sandwiches was looking the best, which made everything really puffy and thick, so I ended up putting two cookies each on the canvases instead of three. Kuragoma (black sesame) Koala, Strawberry Bunny, Cinnamon Kitten, and Pavlova Panda! Each one is 10 in x 8 in. I think my favorite are the kittens, since they looked the most realistically biscuity. I made the choice to NOT put a little stuffing in the koalas, which I made first, and I sort of regret this choice, as I think the puffiness would have enhanced the macaron-ness. I intend to make more of these after the show and will definitely add a little puff to the top cookie. Also, of course, HAIR CLIPS. I’m really happy with how these turned out, even tho each piece took WAY longer than you’d think or I ever expected/planned for. Luckily, I pulled it out! While making these, I was particularly struck by how people would perceive my work as trinkets or novelties for little girls and babies. I have had a hard time with this for a long time, since I design everything as if I would wear it/use it/love it myself, and I think that shoving my work in the “for little girls only” category is really limiting. I will just keep doing what I do, though, and hopefully all the big girls who still have a nostalgic fondness for the fun, color, and playfulness of their girl magic will also get what I’m about. 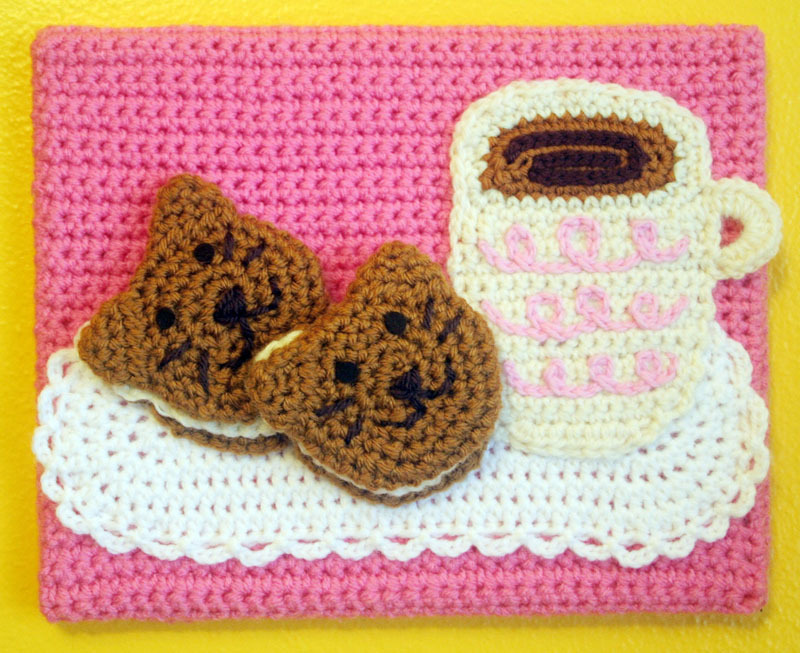 This entry was posted in Crochet and tagged animals, cookies, crochet painting, sketches. Bookmark the permalink. 49 Responses to Macarons. Animals. Macaronimals? I absolutely LOVE these! 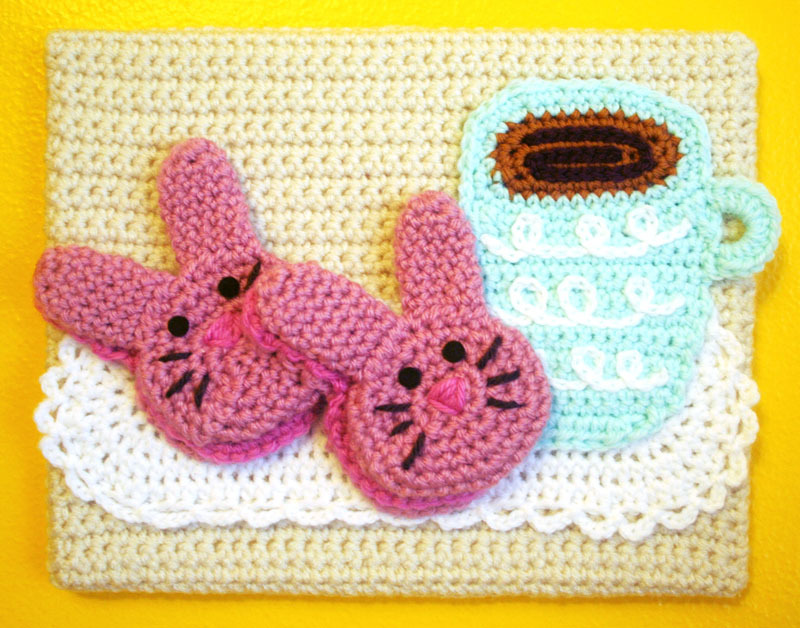 I think the bunnies are my fav c: I wouldnt mind having it framed on my wall haha, and I’m a 20 year old girl! Your work never stops being inspiring. 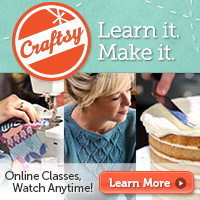 I knew nothing about crochet except doilies and couch covers and you’ve turned my perspective all the way around. I love the Koalas. YAY! I definitely need to cozy my home up with more crochet, but I never have time to keep anything for myself! I also want to do throw pillows! I say this all the time, but you are so AMAZING!! I was really looking forward to seeing the kitten, but I think the Panda is my fave! Regarding the whole “for little girls only” category. I have never thought of your work as that! I turned the dreaded 30 this year and I love your work! I’m looking forward to seeing the hair clips! p.s. Did you get the parcel I sent you? I think my problem with the panda and koala is that they seem more like animals than cookies…even though macarons CAN be gray and black and white :P. I am glad you like the panda, tho! I’m glad they got to you safe! Right after I make I make every single scarf and tissue box cozy in your book, I will attempt to design my own crohet painting; these are inspirational beyond belief!! Thanks, Yasmine! I would love to work on a really big collecttion and have them hanging all on one wall! You have done it again!!! These are AWESOME!!! I am making mini-hats to donate to a company in the U.K. called Innocent. They make healthy juices, smoothies, & other stuff. 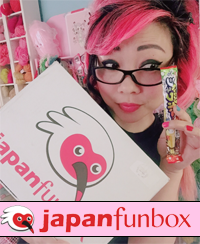 For the past 10 years they have done a thing called “The Big Knit”–tiny handmade donated hats go on their bottles & a portion of all purchased goes to help the Elderly!!! Such a fantastic idea!! I have crocheted a boxfull but wanted to make a few more. Think I’ll adapt these cuties of yours & make some more!!! Thanks for the inspiration!!!! <3 U!!! Hats for bottles? THAT IS SO CUTE!!!! Those came out so awesome! They look great together too. And wow, I didn’t know they were inspired by real koala macarons, I had no idea such a thing existed… not I really want one. I am so tempted to try to make them, but I feel like I would fail and get frustrated!! These are absolutely beautiful! I could definitely see these in a cute breakfast nook, if I had one :)! As far as you being type-cast as making “girlie” items, I think that maybe what people see at first, but if they look at the rest of your work, they will see you appeal to everyone. Your work is so impressive and is out of the box for crochet work. Keep doing what you do girl, you are changing the world! 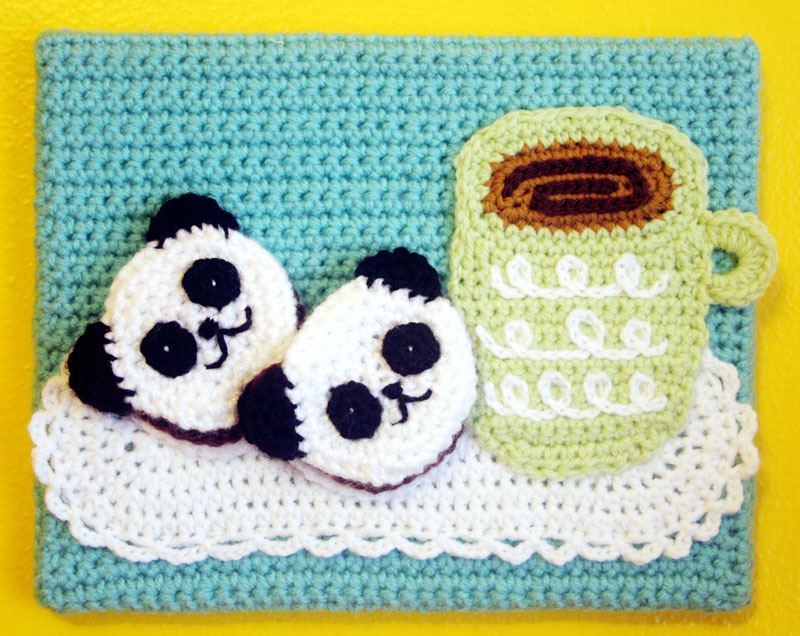 Hah, I love that you’re doing more crochet paintings now! At the last Renegade, one lady was like, “Oh do you think so and so would like this?” and her friend was like, “No, I think she’s outgrown this.” UM HELLO I AM SITTING RIGHT HERE AND I HAVE CLEARL NOT OUTGROWN IT. I think as a saleslady I should have engaged them and said that it was fun for all ages or something, but I usually don’t like to bug people. P.S. I think maybe it was etsy that posted an article debating about whether or not “cute” was hurting the handmade community because then we wouldn’t be taken seriously. Or something like that. I was extremely miffed when I read it. Why should “cute” damage credibility in any way? You and other vendors with a similar sense of aesthetics are some of the best out there selling high quality products, devoting time and maintaining integrity in the handmade world. Anyway… this just reminded me of that article. Ugh. I saw that on Etsy as well, but I didn’t read the actual article, did you? the other thing that bugged me about the Etsy part was all the comments bashing Craft Wars and people admitting they hated it even though they never even watched it! I can see why people don’t like it, but I still really like the idea that the show is bringing craft to people who may not craft already. I think you may be right – I obviously don’t remember it all that well, but I do remember thinking there was some sort of confusion between cute vs. low quality. It just seemed so negative and snooty overall. I agree about the Craft War things. I would like to think people know the difference between a reality TV show that’s totally for fun, just putting crafts in some sort of a competitive environment, vs. handmade items shop owners sell for a living and spend years perfecting. I hardly see how Craft Wars hurts anything when it’s clearly just for the fun of it! I hope you find a way to make it! I am totally not familiar with the Echo Park area, and I keep asking friends if I’m going to get murdered hehehheh. They are adorable, my fave are the panda ones by far, but they are all really cute and the colors work really nice one with the other. I was just thinking back to what I wore when I was 11 in 6th grade. EMBARRASSING. I was trying to dress like a mom, I think. Long skirts, big shirts, with a big belt over it, and a floppy hat. I guess I’ve always been weird. Thank you for being a source of inspiration to me! Hi Corrie!! HMMMM ONLY THREE? hehe. Touch choice!!!! I love the pandas! 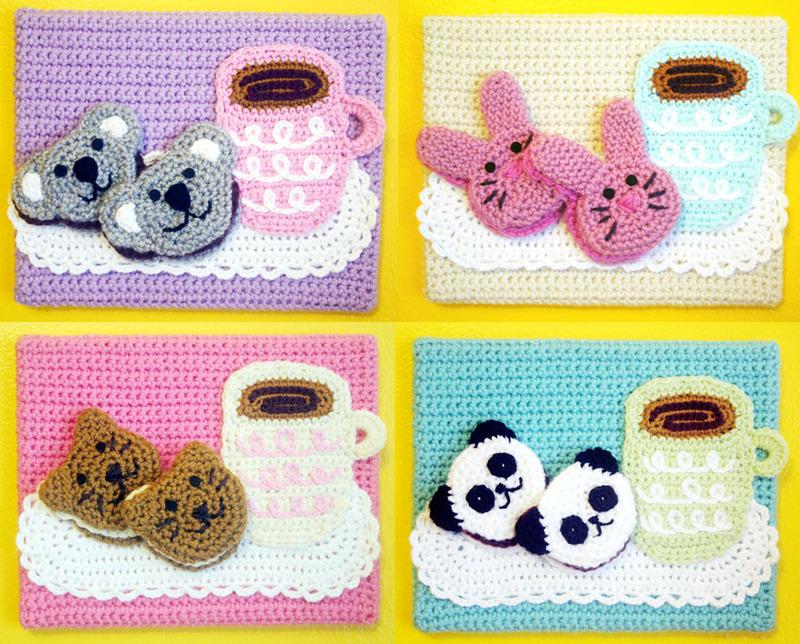 and the others are super CUTE! These are amazing! You have inspired me to make my own crochet painting but mine probably won’t come out as good as yours. I LOVE the idea of crochet paintings! Beautiful, precious, things on your wall! My bedroom wall is so bare and empty, I want to try this so badly! And I am sure my sisters and cousin and friends would love them too! 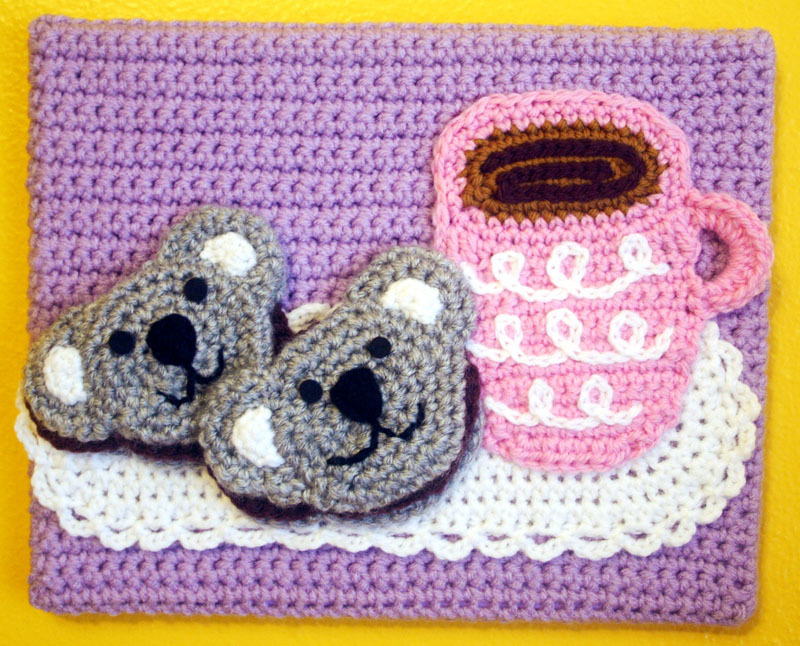 I want to try something unique… I am going to try to crochet a crochet painting of… The Upside Down! It is from Stranger Things, A Netflix original. It’s going to be hard, but I want to try! DO you know where a pattern for these paintings are? Hm, I don’t know if anyone has suggested pattern for a painting. I always just sort of wing it, since they are all different. Basically just make a rectangle to cover the a canvas and then create stuff to sew on top of that! And yes, I have seen Stranger Things. Definitely an ambitious project, but definitely try it out! Just experiment. There are no rules.